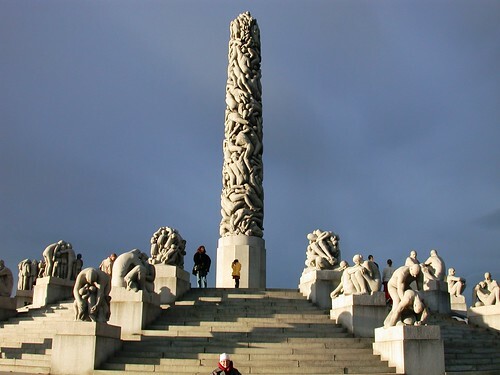 The Vigeland Sculpture Park is the most striking part of Oslo’s Frogner Park. Gustav Vigeland’s (1869-1943), 212 sculptures attracts over 1 million visitors a year – even more: Vigeland also designed the layout of the entire park. It’s a popular recreational area with a human message presented through the many sculptures depicting the life cycle, and is a must see when you visit Oslo. The Fountain is the earliest sculpture unit in the park. In the center of the basin, six giants hold the large saucer-shaped vessel aloft and from it a curtain of water spills down around them. Water, a universal symbol of fertility, is used within the fountain complex in a meaningful juxtaposition with the twenty “tree groups” on the surrounding parapet, the latter evidently symbolizing the “tree of life”. The word monolith means literally “one stone”. It took Vigeland over 10 months to make the original model in clay then it was done life size in plaster. The stone monolith was begun in 1929 and took 14 years carve all the figures. It contains 121 figures climbing up towards the sky and is meant to represent man’s desire to connect with the divine. Below you see the view from the monolith platform back over these two smaller fountains and in the background you can see the Tree of Life and the view across the park centered towards the cathedral in the distance. Vigeland originally wanted to use another church which did not lay exactly on the axis of the park – and because of that he wanted them to move the entire church. This was not done but the church in the background was built intentionally to line up with the park. So great were his visions! As you can see in the photos above there are many tulips and spring flowers, but an army of gardeners which maintain the park change the flowers several times to match the seasons. This park is lovely to visit and popular throughout the year both with tourists and the locals. Are you tempted to take a guided tour now?? Come and visit us and we will be more than happy to show you around. I remember vividly when the guide explained it to the tree of life. You already know I’m stepping peace only to Norway but in the Vigenlans Park special feel peace, a quiet magic. Good but you already know that mine is pure magic with Norway. The photos are beautiful, I never tire of looking at your blog. Many times I remember your blog and read just to feel closer. It certainly is lovely in the spring too! I’ve only been there in February with snow the first time and the second time were at the Oslo blog gathering in that rather cold weather we had that day unfortunately. This look wonderful with all the flowers! When you see this up close and personal in real life, Renny, it becomes one of the wonders of the world. Really. It’s hard to believe this was done all by ONE person!!! Beautiful gardens Renny! The photos you took are lovely as well :) Btw I think it’s time to change your background picture. What do you think? Thanks so much for your posts. I use them from time to time to show people about my life here…you do a better job than I could do, so THANKS! My new but used the Canon S11 has arrived in the mail. Looking so forward to taking movies and photos with it, especially on my trips. .. This park is absolutely beautiful: congrats. I particularly love the ducks and the tulips (although I am not much of a flower fan). Any celebration to nature is worthy of admiration and this park seems and ode to Mother Nature. I hope all is well with you and Diane, mate. The thing I still shake my head about, nor am I able to grasp was growing up I wondered how the plants always looked so beautiful.. I had no idea it took an army of gardeners to make things look that pretty. My mom and I always wondered how some people or some areas did it.. NOW I really know, but it came to light while living in Switzerland and being able to smell the flowers and watch all of those gardeners hard at work. It was so much fun to enjoy it all, just like you are too! Pierre and me we are admiring your pictures with a lot of nostalgy! Such a good time we had with all the participants at Vigeland Park! I hope to visit it for an other season and see the marvelous nature around the sculptures in all its beauty! I loved this park in summer and would love to see it during each season of the year. It is a beautiful park I agree.